The national qualification for painters and decorators is currently under review and is due for a major update. Artibus Innovation, in consultation with the Technical Advisory Group for Painting and Decorating are working together to bring the course up-to-date. This important work happens about once every 12 years and it sets the curriculum for apprentices for the next decade. On behalf of the Construction, Plumbing and Services IRC, Artibus Innovation is seeking stakeholder feedback on the Certificate III in Painting and Decorating. Certificate III Painting and Decorating is the nationally recognised qualification for painters and required for licensing in SA, NSW, and QLD, and can be used for registration in WA and Victoria. It is the certificate issued to apprentices on completion of training. A new unit added entitled 'Prepare New Surfaces for Painting'. Protective Coatings to become a core compulsory subject. All apprentices to recieve training in mixing two-pack epoxies, working to specifications, quality control, preparation of metal and concrete. The number of core units to now be increased to 25, with only 3 elective units. Only 28% of employers say they are happy with the training their apprentices receive at TAFE or colleges and 73% say that apprentices require more training in preparation of surfaces. This has led to employer dissatisfaction with training outcomes and poor technical skills in the industry. Will industrial rope access be taught to painters? Rope access has been part of the trade for over 130 years and was traditionally known as a 'bosun's chair'. It has been taught at several TAFEs around Australia for many years. Many painters are learning this skill again so as to be able to do painting maintenance on multi-story buildings. Currently it is only taught at non-accredited colleges with un-recognised qualifications, which is dangerous for such a high risk activity. 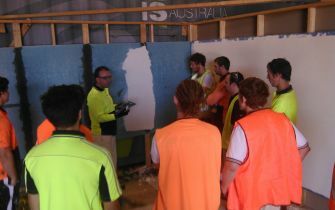 It is important that this part of trade training is subject to the Australian Quality Training Framework. The proposal is for the subject to be an elective. This means it does not have to be part of the course and would only be chosen by employers who do industrial rope access work. The industry survey showed that about 50% of the industry supported the development of the unit. Artibus is consulting with other trades to establish whether the unit will be developed. Is the trade being watered down? No, in fact there are two new units that have been proposed to be introduced as core units to address the issues of poor trade skills in the industry. These units are on protective coatings and an additional unit on surface preparation. In addition, more training will be provided in spray-painting. This means that apprentices will recieve additional training in the skills that really make the difference between a handyman and tradesman. Why aren't apprentices required to learn everything related to the trade? The proposed course includes 25 compulsory subjects and 3 electives. This allows employers and students to choose subjects that they feel would be valuable to them and that they can specialise in. Employers and students choose up to 3 subjects as electives. Therefore, no apprentices are learning everything related to the trade. The electives include anti-graffiti coatings, intumescent coatings, financial management, business legal requirements, advanced wallpapering and advanced decorative finishes (such as murals, gilding and traditional finishes). This allows painters to specialise in certain skills. It is not possible to do all 31 subjects within the time for the apprenticeship. Will there be any changes to length of time it takes to complete an apprenticeship? No. This has nothing to do with the duration of apprenticeships. In fact, we hope we can fit in all the additions to the course! The National Painting and Decorating Institute urges all employers and painters to comment on the proposed changes so that we can bring the trade into the 21st century and provide the industry with the skills they need for the modern building industry. Having Rope Access as a recognised unit in the Painting Qualification will be a definite game changer. We are setting up for our first rope training courses this year and will be doing so with the purpose of rope access. To gain work position and carry out professional trade application. Lucas, you are absolutely right. We need to bring the standard back into the industry. As a painting Lecturer at Tafe, I believe the specialised skills are necessary to nurture as the trade is being dumbed down to glorified brush hands not craftsman. We need decorative painting all forms taught, wall papering ,timber finishing, murals, colour knowledge, historical restoration- Lead abatement, window glazing & most importantly skills & knowledge of preparation of all surfaces. More face time is also require to teach these subjects. I am against onsite training as it just dumb downs the trade. Old style finishes are seldom used today, more time should be spent on the modern finishes such as metalics, pearl finishes and even distemper and lime washes. More time is required on paint technology, surface preperation and understanding why a coating doesn't preform as it should. I totally agree with what said above we face thin in Fiji to. I would like to comment first on the apparent dumbing down of painters. I have been in the Industry for 40 years and it's not the training that has dumbed us down. It's the apparent willingness of painters to work for next to nothing. You here people say anyone can paint, well we know that's not true but ever since painting has been sold to the public as a do it yourself our trade has lost the way. I think this new incentive and training package will certainly help. Walllapering ceilings has a big question mark for me?? I have hung endless rolls of paper, but frankly only a few times in my life have I been asked to line a ceiling, in the 8o's. So in my view not relevant. I think painters should be a collective to tackle the paint companies and stop underselling us. For example taubmans specify a 2 coat system on new housing , what rubbish is that! They do the deal with the builder, we are forced to apply rubbish standards. No wonder it looks like "anyone can paint". Guess who gets the rebate on the paint we use? You guessed it the builder. We used to be called Master Painters but now we are people that apply paint to the standard they want. We need control back and support from the paint companies. Oooops getting carried away sorry. I do not agree with the removal of conventional spraying as this remains a most necessary form of spray application in both the domestic and industrial sectors. HLVP application is very common becoming a necessary technique and conventional spraying is more practical for smaller jobs. I agree with the above post in regards to wallpaper ceilings,I have never done, or seen this done for over 30 years so Why? I am unsure also of the direction of prepare new surfaces, and why we would require a specialized subject for this .